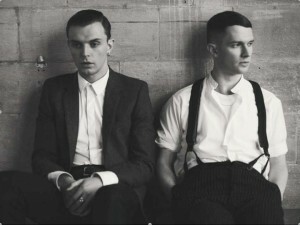 The boys from Manchester duo Hurts have fast developed a reputation for providing visually stunning videos containing very little colour, but a whole lot of style. And the clip to the band’s third single ‘Stay’ is certainly no exception. Young Theo walks out of the ocean with a young maiden by his side. No doubt they’ve been overseas but lost their plane tickets, so have opted for the long walk home along the ocean floor instead. And what an ocean floor it must be – very cold, dark and grey what with all the volcanic sand they find themselves walking upon. That’s one aspect of the clip that makes everything seem so cold and uninviting. Black sand, grey skies, crashing grey waves. But as always, the sparing use of colour throughout adds subtle dustings of warmth and heart. We’re not as sold on ‘Stay’ as we were on ‘Wonderful Life’, but that doesn’t stop Hurts being one of our favourite new pop acts of 2010. They are an amazing band! I wish them nothing but success. Their album is one of my favs this year for sure! Hmm, they should have released the track with Kylie on it, it is fab!